Wednesday: night: Clear & cool. Mid 30s in the suburbs to low 40s in Boston. Thursday: More sun! Cooler, not as windy. Mid 50s. Friday: Clouds thicken. Showers late. Cool & raw. Upper 40s. 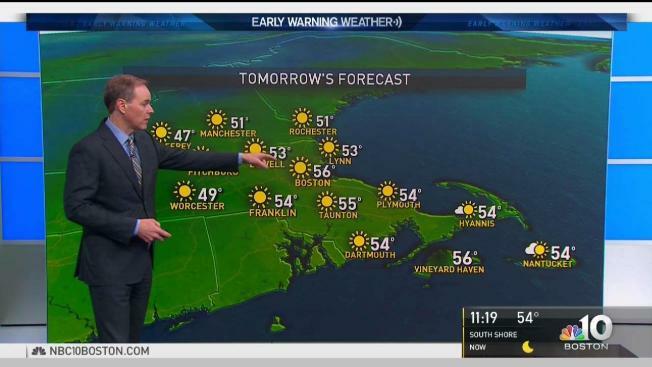 Beautiful sunshine dominates New England weather not just Wednesday, but Thursday as well. Temperatures on Wednesday will top out in the 50s and 60s, with a somewhat gusty west wind 10 to 20 mph. Overnight temperatures will drop into the 30s and 40s, so Thursday morning will feel much more November-like. By Thursday afternoon highs will be reasonable as well, reaching the 50s. Our next round of rain spreads in during the day Friday after any early sunshine is swallowed up by increasing clouds. The rain will fall heavily at times Friday night, with many towns picking up half-an-inch to an inch. In the mountains of Northern New England, this will start as a wintry mix and snow. Rain ends early on Saturday, allowing for clearing over the course of the day. Temperatures will be in the 40s and 50s both Friday and Saturday afternoon. Cooler air spills in after that, however. Highs on Sunday will only be in the 40s despite sunshine. Monday will be just as cool. Another storm likely brings rain, and potentially some wintry mix, by the middle of next week.